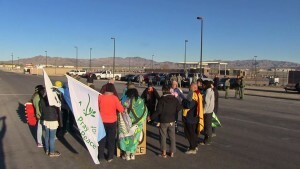 At the prayer-action for justice and peace, a dozen people vigiled near U.S. Highway 95 while the majority entered the frontage road to Creech. 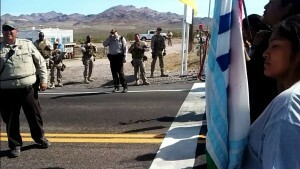 At the end of the five minute warning given by Las Vegas Metro Police, a dozen peace walkers retreated to the vigiling roadside and eight were arrested, cited, and released on site after a half-hour of singing songs such as “Sometimes it causes me to tremble… were you there when they killed him with a drone?” All participants were protesting that the U.S. Air Force uses Unmanned Aerial Vehicles (a.k.a. Remotely Piloted Aircraft, or weaponized drones) to target “potential” threats 365 days a year, 7 days a week. Such strikes have been proven to kill many civilian targets and the alleged “detachment” from war has not been enough to stem the tide of PTSD among drone crews. “We pray that the killing will stop, and we sing, sending the healing energy out to stop drone warfare,” said participant Vera Anderson of Las Vegas. She was arrested by Metro police under the charge “Pedestrian in Roadway” along with Rev. Carolyn Metzler (New Mexico), Gilberto Perez (Washington), Susan Dillon (Utah), Peacemaker Boy (Nevada), George Killingsworth, Marcus Collonge, and Catherine Hourcade (the last three from California). 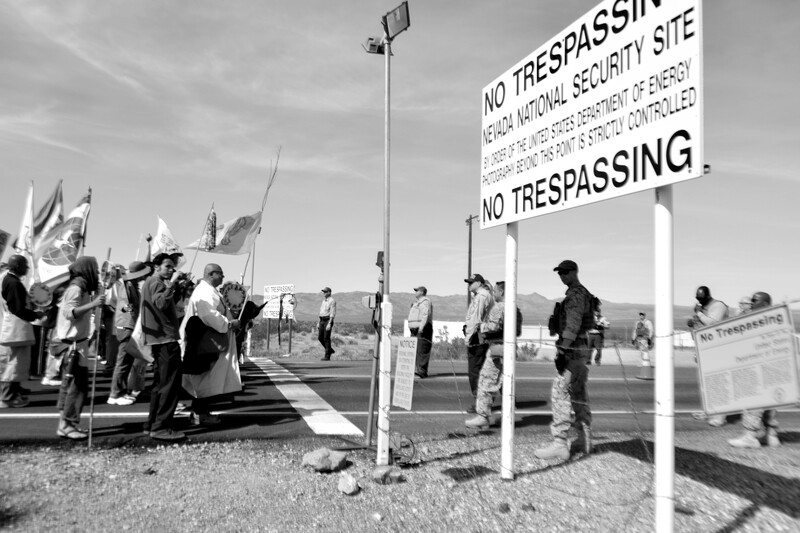 MERCURY, NV – At 11:15 a.m. on Good Friday, March 25, 2016, eleven women and ten men were arrested during a nonviolent demonstration of peace in the roadway leading to the Nevada National Security Site (NNSS, formerly called the Nevada Nuclear Test Site). 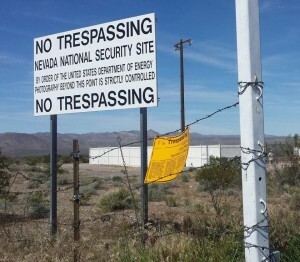 Forty-seven people had gathered at the entrance to the NNSS only to be greeted by security guards and Nye County sheriffs. This was the culmination of the annual Sacred Peace Walk of three dozen peace walkers hosted by Nevada Desert Experience. 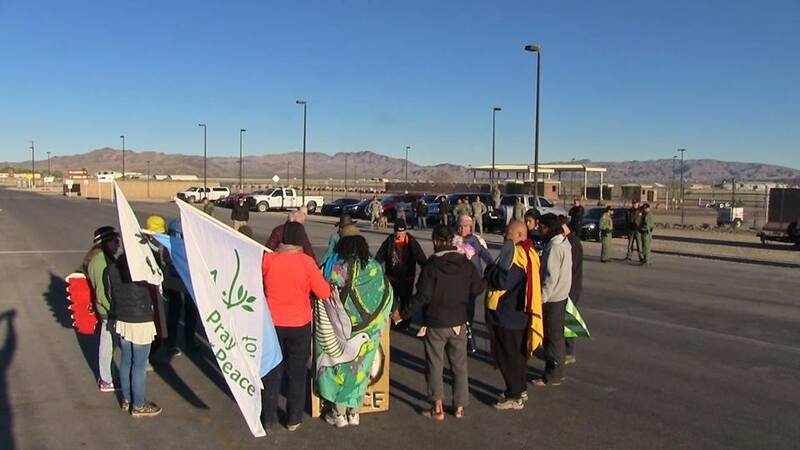 Earlier in the week, the walkers held a vigil at Creech Air Force Base, including a prayer-action in which eight people were arrested and cited and released for protesting weaponized drone killings. 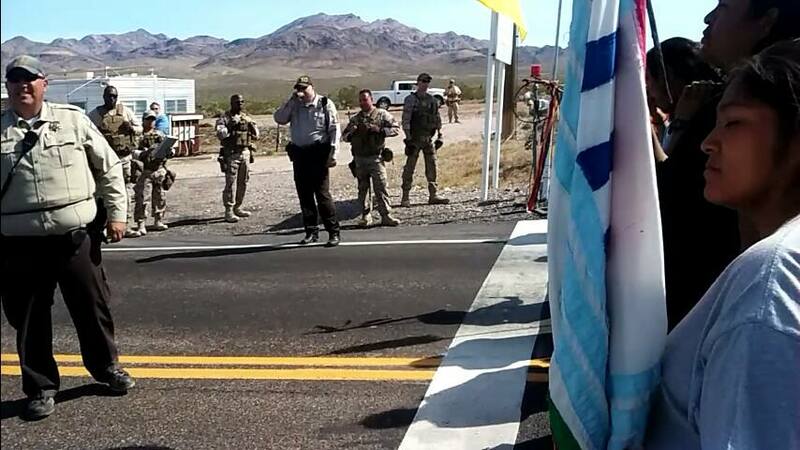 This morning’s ritual line-crossing and arrests at the NNSS followed several prayer services. The day started with an Indigenous Sunrise Ceremony at 6:30 a.m. A Christian liturgy was held with a communion service after breakfast. 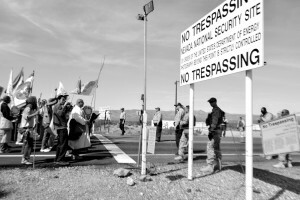 Chief Johnnie Bobb of the Western Shoshone Nation led the group in a blessing at the Mercury exit of US95, preceded by the Good Friday Nuclear Stations of the Cross ceremony around 9:30 a.m. in the historic Peace Camp tunnels under the highway. 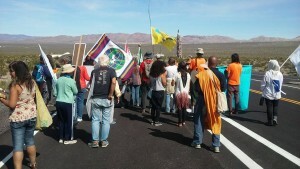 Participants in Nevada Desert Experience events are mobilized to create nonviolent social change and are actively reconnecting personal responsibility to care for the environment, planet, and people through public demonstrations of peace. 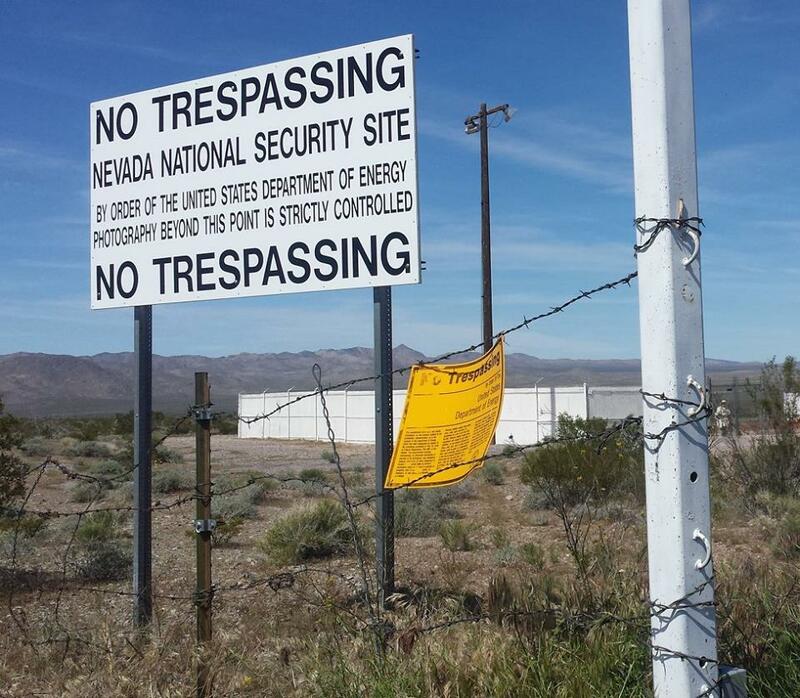 Nevada Desert Experience (NDE) is a nonprofit organization founded in 1982 with a mission to stop testing, development and use of nuclear and other weapons systems through a campaign of prayer, education, dialogue, and nonviolent direct action.